Saxophonist and composer Perry Conticchio has built his 35-year career using the singular jazz sounds of the 1960s as a point of departure. His formal studies were at Miami University of Ohio and Berklee College of Music in Boston, where he studied with Joe Viola, John LaPorta and Charley Mariano. Moving to the Washington, DC area in 1976, Perry became an established figure in the "new" music scene. During this time he had the opportunity to perform with and learn from Don Cherry, Anthony Braxton, Sam Rivers and many others. From 1994-1998 Perry was co-leader of the successful jazz quartet "Clarity". Since then he has been leading his own quartet and contributing on projects with many area bands, including the Thad Wilson Jazz Orchestra. Perry has performed at many Washington area cultural events and nightclubs including The DC Jazz Festival, The Smithsonian Folk-Life Festival, Johns-Hopkins Spring Fest, Blues Alley, One Step Down, Twin's Jazz, The 9:30 Club and too many others to mention. 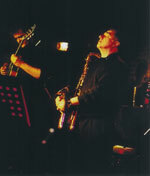 His first CD, simply titled "The Perry Conticchio Quartet", was recorded in 1999 and contains classic jazz as well as original songs that highlight Perry's unique improvisational style. Perry's newest CD, "Speak Your Truth" is primarily original and receiving profuse and positive reviews throughout the jazz community including Jazz Improv Magazine. Perry currently leads his own Quartet/trio and is featured with the band Colla Parte. The newly re-formed and energized Perry Conticchio Quartet showcases the band's mastery of jazz improvisation. High-energy solos allow the performers complete freedom of expression and punctuate the new quartet's tight musical interaction. The ensemble has taken off with fresh interpretations of the masters such as Miles, Monk & Coltrane, as well as contemporary composers Pat Metheney, Sam Rivers, Wayne Shorter and others. Perry's own compositions further reveal the group's capacity for sensitive expression. He leads the new quartet in producing an exceptional level of jazz consciousness. From the intimate lounge to the concert stage a wholly satisfying listening experience is created. Colla Parte-loosely translated, “with the lead voice”-is an instruction for accompanists to follow the lead of a solo performer. Colla Parte the ensemble brings together three musicians with deep backgrounds in jazz, classical and contemporary art music to create a unique form of improvised chamber music combining the refinement and intellect of art music with the passion and freedom of jazz. Drawing on a broad palette of instrumental color, the ensemble’s winds, double bass and mallet percussion interweave in a free counterpoint of constantly changing lead and counter-lead voices- a braiding of melodies around each other in improvised polyphony moving from expressionistic intensity to reflective introversion and back again. The result is a stimulating sound environment as lyrical as it is challenging. Colla Parte consists of (in alphabetical order) Daniel Barbiero (double bass), Perry Conticchio (reeds), and Rich O’Meara (vibes and percussion). “Fields/Figures” uses a combination of colors to produce a constant musical flux based on a melding of the individual contributions of the participants: here one can really breathe the art, savoring it as in a gallery, such is the skill shown by the trio, and run the risk of falling in love. I find myself facing a work and musicians who should have a larger audience. Perry Conticchio, a saxophonist/flautist influenced by the New York jazz of the 1970s, develops (I would say in definitive form) a singular jazz made of introversion and intensity, in a context different from the more conventional quartet he leads; Rich O’Meara, a highly-regarded vibraphonist/marimbaist and collaborator in the Silent Orchestra (an ensemble put together to play at art festivals, museums and theaters), creates a contrasting tension of mystery and reflection; while Daniel Barbiero constructs around them a perfect classical-modern counterpoint. Particularly active (he has played on Centazzo’s latest disc, as well as with the DC Improvisers Collective with special guest Greg Osby on Live at the Warehouse), Daniel works on many projects, some more conventional, others more unusual, but always maintaining that “experimental” touch and binding together jazz and classical forms, which is the prerogative of the more competent contrabassists on the American scene.